After you have clicked the button to Transmit Boxes to Seller Central in InventoryLab, we begin to process something called a feed. This is how the data from InventoryLab is transferred over to Seller Central. Next, you will finish up getting your boxes prepped, fully sealed and packed, weigh them, and provide the dimensions detail to Seller Central. 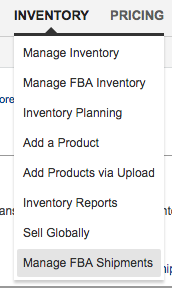 Click on the Work on Shipment button located to the right of the shipment you’d like to complete. If you scroll down to section 3, you will see that Amazon Marketplace Web Services has already been pre-selected for you as a way of providing your Box Content information. This is because when you first created your batch with InventoryLab, you indicated that you’d like to provide your Box Content using feeds from our service. Amazon blocks you from changing this once selected to prevent conflicting information from being submitted. You will need to enter weight and dimensions for the box numbers that are automatically carried over from InventoryLab. Provide the weight, length, width, and height of each box. Keep in mind that you already know the number of boxes in your shipment, as well as the order of those boxes, due to information provided in InventoryLab. The order you enter this information is very important because you want them to line up InventoryLab with Seller Central. 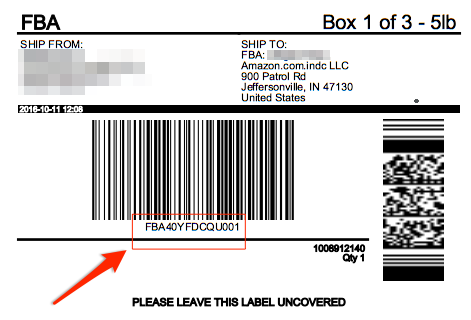 InventoryLab’s box names are created in numerical order, just like Amazon’s. If you skip a sequence in InventoryLab (say you had Box U001, U002, and U003… but then you deleted Box U002), the order will be a little off. To make everything as simple as possible, we recommend doing to your best to avoid the need to delete any box names. After weighing and measuring your boxes, Calculate and agree to your shipping charges. Then, print your shipping labels. Assuming no box names where skipped in InventoryLab like Example 1 above, the name on the 2nd page of your shipping label should correspond to the name of your box in InventoryLab. Finally, click on Complete Shipment.